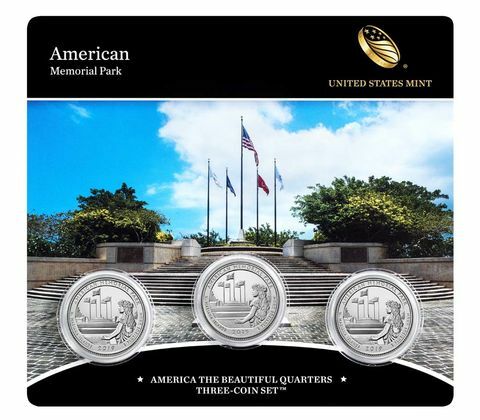 WASHINGTON – The United States Mint (Mint) will open sales for the America the Beautiful Quarters Three-Coin Set™ containing coins honoring American Memorial Park in the Commonwealth of the Northern Mariana Islands on April 17 at noon EDT. The set (product code 19AE) is priced at $9.95. All three coins are mounted on a durable plastic card with an image of American Memorial Park. The Certificate of Authenticity is printed on the back of the card. A limited supply of sets will be available for purchase over the counter at various United States Mint sales centers.